Hey guys! How are you all doing? I feel great. The past day has been somewhat of a breakthrough for me. It was cold yesterday, but wanted to get outside anyway, so I got in my running clothes and outside the door. I didn´t feel like doing my normal HIIT running training today and I didn´t want to pressure myself to anything, I just wanted to run a bit. So I did, I found my pace, which is something I´ve never been able to find before. I felt amazing, just jogging not pushing myself to go faster. Letting the trees go by, inhaling the fresh air, I really felt good. To my amazement. I ran for 42 minutes straight, which is by far the longest I´ve ever gone. I´ve never been a runner. I´ve always loved to idea of outdoor sport, but then again it´s so cozy inside and I can get a real sweat on there as well, without having to move my body forward and possibly get wet or cold there… Yes, I was that kind. I was happy doing my Pilates and Yoga indoor. Now don´t get me wrong, I really do love Yoga and Pilates and I want to keep doing it, but the idea of running never really let me go. At the beginning of this year, I thought I´d finally do it. I literally started at zero. My stamina was so bad. I thought that just jogging lightly for 20 minutes would´t be a problem. Yet after 10 minutes I kept checking the clock when 20 minutes would be over. I really pushed myself to go. My body didn´t really like it. It preferred doing all kinds of torsions on my mat. Or feeling my abs burn. It hated actually moving forward. My first runs were exhausting, but I loved the feeling afterwards. So I kept going, getting better every time. My longest run was 26 minutes. You might laugh at that, but I really felt proud of myself for improving so fast. Which I really did, yet I always ran anyhow, altering speed, not finding my pace, just thinking about keeping going, not letting go. I even got a few friends involved, who joined me from now to then. But running and taking became exhausting and so we just walked long ways, which was´t the point of it all… Yet that was fun and running was hard. That´s how it came that not long after I´d started I stopped again, going back to full-time Pilates. In the gym I would still run for 20 minutes to warm-up. I found it a lot easier running on the treadmill than outside. In the gym I really improved and got back the joy of running, being able to run 3 km in 20 minutes. I also started at that time, around May/June 2015 to run every morning. Only shortly, but that´s more than nothing. Yet again, I stopped, wanting to eat longer and cook for myself in the morning. On vacation in Italy I had to walk a lot and I really enjoyed that. I love hiking and I dreamed of doing long hikes on high mountains. In September I started my HIIT running sessions and really enjoyed running outside. I read articles in magazines and posts of people running long distance, marathons, 10ks, half marathons, triathlons, … I wanted to be able to do that too, but never really thought of actually doing it. Not until I read this post from the blog Developing to potential. She´d finished a triathlon, training only 8 months! How amazing and crazy is that? In response to my comment about how great I found it and that I want to do that too in about 2 years, she wrote, “why in 2 years if you can do it now, what´s stopping you?” That really got me thinking. When I ran those 42 minutes yesterday, feeling nothing else but happiness all the way. I thought about another thing I´d read. There are 10 weeks left of 2015. That´s enough for me to train for a half marathon. 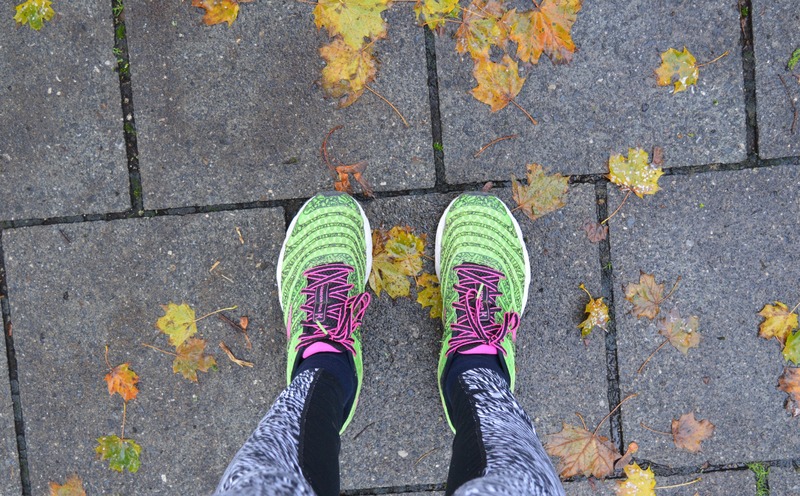 I love my running shoes and my pant! Get´s me so motivated! 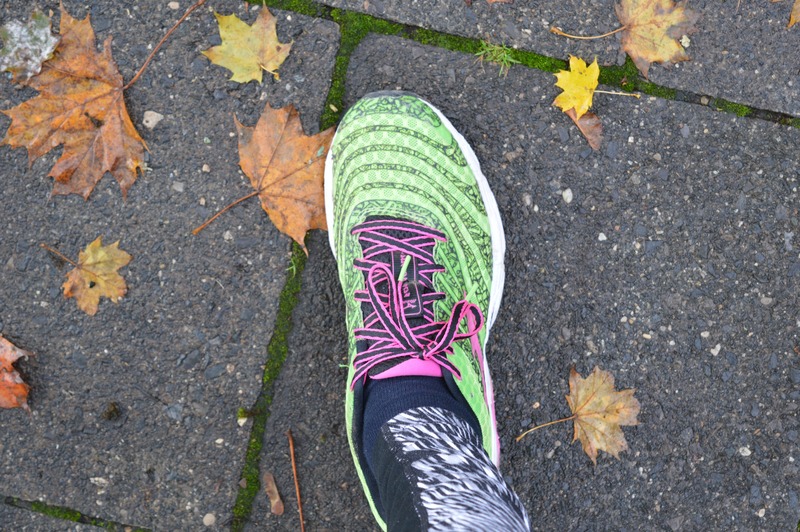 What do you wear when going running? I talked about it with my parents and they were really supportive. I was so extremely happy! I really wanted to do it. Meaning I really want to do it. And I think I really can do it. I have the feeling of being able to take all my struggles of this year and finish it off with a huge success. My plan is to make a plan;-) to finish half a marathon by the first January 2016, even if that means getting up early in the morning to run. Then I want to keep training to then run a full marathon maybe in April/May 2016. I don’t want to get a specific time running any of these races. I want to just make it over the finish line and have fun doing so. I thought about sharing everything on this blog, first of all because I think the chances of me quitting are lower if I write all my process down and sharing it with you. Second, because I thought that maybe some of you out there are also dreaming of running, but like me have always struggled and given up, never really enjoying it. Maybe I can motivate some of you out there to get up and do it. With me. We can stick together and motivate each other, maybe motivation some others along the way. That would be combining two of my dreams in one. Running a (Half) Marathon, maybe even one for Charity (I´d love that), and getting others to pursue their dreams. Because no one is ever to young or old to realize a dream! I´ll be then posting my training plans, small steps I´ve taken, progress, etc. on here and I´d really love to hear your thoughts and also if you´re in doing this challenge! Half a marathon in 10 weeks! I´m excited! Ha, planning to make a plan, I’m always doing that too! Great post! Kept me hooked till the end! Thanks so much:-) I´m flattered..
That’s great to hear. Blogging is a good way to keep training on track. Have fun with your running. Hey, I’m so pleased that you’ve started!! This is totally amazing and I LOVE IT!! Keep on running, keep telling us all about it, and cannot wait to celebrate your first (of many!) half marathons soon! Go you!! Thank you so so much, dear<3 seriously you made my day! I can´t thank you enough for your words and for that blog post and comment that inspired me! I will write about it, I promise! I´m so incredibly thankful! Go you for getting back on track!!! You can do it!